An entire Torah was unwound for the very first time at Kol Chai Hatch End Reform Community to celebrate Simchat Torah. 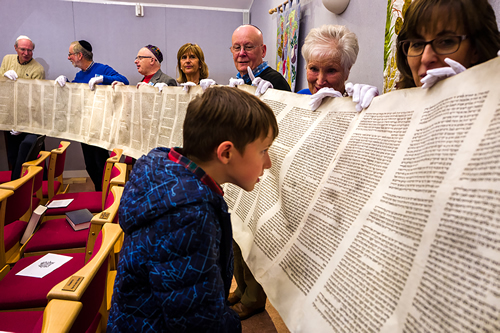 Families watched their rescued eighteenth century Czech scroll being unrolled from beginning to end, held up by ‘gloved’ members of the community, as it wound its way around the shul hall. Summarising each section and with children following her progress along the Torah, Rabbi Naomi Goldman said: “ the Torah is a mirror, a journey we walk every year. This gave us a chance to engage with it physically – and walk through it in 10 minutes! It was a fun and multi-generational experience”.